Editor's Note: There is one photo associated with this release. It seems the people are the story at Trailcon Leasing these days. It's been only a few months since two top professionals moved into their new roles at national trailer and intermodal specialist Trailcon Leasing Inc., but already they are contributing to the ongoing growth promised earlier this year by Trailcon President Alan Boughton. Transportation industry veteran Mike Krell, a member of the Trailcon team for 15 years, has taken on the role of Sales & Marketing Manager (Canada). Randy Legare, CMA, joins Trailcon as Controller. In February, Boughton announced Trailcon's purchase of Calgary-based Hubs Trailer Service, saying that Trailcon was "in growth mode." "The foundation of any growing business is a team of people with the ability and drive to take the company even further," Boughton said. "We are preparing for the future through succession planning and building the business." Boughton said Krell is respected within Trailcon and across the industry. His customer base includes many who have partnered with Trailcon for more than a decade. In 2000, when Krell started with Trailcon as an account representative, the company had 2,000 trailers and 15 technicians. Today, with 75 technicians, Trailcon owns a fleet of 6,500 units, servicing companies such as ATS Healthcare, Canada Cartage, and National Fast Freight, as well as some of the largest grocery and retail chains in the country. Its dedicated fleet maintenance operation looks after an additional 8,500 customer-owned units across Canada. "The successes we've had are based on doing things right for our customers," Krell said. "I've had a lot of success at Trailcon because I understand how to build and maintain long-term relationships. Since I've been in this key management role, I've been focused on maintaining the highest possible standards of customer service across the country. As we expand, we have an amazing opportunity to help existing and potential customers develop their own businesses, whether they rent, lease, or require dedicated fleet maintenance or service." Legare's expertise in business management and finance was gained primarily with a large elevator/escalator design and service company, where he spent the previous 14 years of his career, most recently as Accounting Manager/New Construction Controller. He says he's pleased to be part of a homegrown Canadian company that is leading growth in the busy goods movement sector. "You might say it's a bit of a leap, from elevators to trailer leasing, but this is a great opportunity for me to put my experience to work in a different way. My focus here is to support our geographic growth plan by making sure we're ahead of the game with world class IT systems and other resources and infrastructure that will support a national company." Legare also serves as Business Strategy Consultant/Moderator for the Society of Management Accountants Canada. He has been an instructor of professional accounting programs for the last eight years. Trailcon has operations in Mississauga and Cornwall in Ontario, and Edmonton and Calgary in Alberta. An impressive new location for the Mississauga head office is currently under construction. "Trailcon is just an exciting place to work," Boughton said. "We're all in a coast-to-coast mindset right now and that gives our people a lot of fulfillment. They are having fun while doing their good work." More information about Trailcon is available at trailcon.com. To view the photo associated with this release, please visit the following link: http://www.marketwire.com/library/20140423-800tco.jpg. 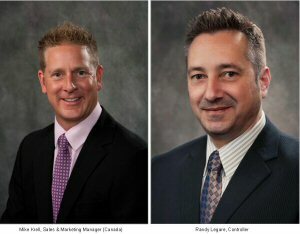 About this company Trailcon Leasing Inc.
Two top professionals contributing to ongoing growth at Trailcon Leasing.